Diurex Water Capsules contain an effective yet gentle diuretic to help promptly increase the outflow of temporary excess body water, relieving monthly water weight gain, puffiness, bloating and swelling. Each Extended Release Diurex Water Capsule releases hundreds of tiny, quick dissolving, medicated beads for hour-after-hour of relief of symptoms. 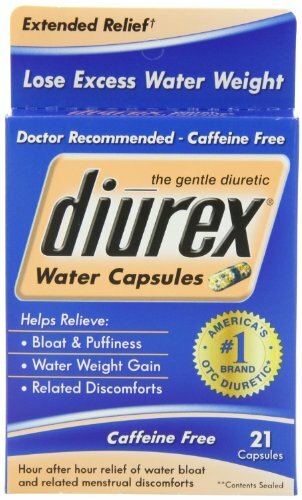 Diurex Water Capsules are Caffeine Free, so you can get relief of bloating any time of day. It is the #1 best-selling brand of over the counter diuretic water pills. So, if you're suffering from excess water weight gain, get effective relief with Diurex Water Capsule water pills to help reduce excess body water relieving the symptoms of bloating, puffiness, water weight gain and other related fatigue issues. Millions of women trust Diurex... The Bloat Medicine to relieve pre-menstrual and menstrual discomforts. If you have any questions about this product by Diurex, contact us by completing and submitting the form below. If you are looking for a specif part number, please include it with your message.